Not too long ago, a visitor to a Saudi Aramco refinery or production facility would have found themselves in a man’s world. Every employee – from the frontline technicians to the most senior manager – would have been a male. But Saudi Aramco, with its talented young workforce and a commitment to fostering meaningful careers for both men and women, has made dramatic strides in recent years to draw on what some have called the company’s greatest untapped resource – female employees. During a recent safety review at the Ras Tanura Refinery (RTR), senior executives were pleased to see that two of the engineers making presentations to management were women whose work takes them into the refinery on a daily basis. Numbering nine in total at RTR and Terminals – with even more women working in the RT labs – these women may be pioneers of a sort, but they are not alone. At a growing number of facilities and in a growing number of admin areas, women are finding their place in the front lines of the company’s core businesses of Upstream and Downstream, working as mechanical, chemical, and petroleum engineers; chemists, lab scientists, and safety inspectors; and geologists, geophysicists, and IT specialists. Their supervisors all agree on one thing: Each one of these women is well prepared for the work, highly motivated, and their example will be transformative for the company, paving the way for other talented women to take their place out in the field. "I was very impressed to see the capabilities of the women at Ras Tanura," Abdullah O. Al-Baiz, vice president of Engineering Services, says after an Executive Management Safety Review. "It’s good to see women get the opportunities to work in our facilities and plants." To be sure, the oil and gas industry worldwide lags behind other industries, such as manufacturing and information technology, in adapting to the influx of technologically savvy female employees. According to a 2017 report by the World Petroleum Council and Boston Consulting Group, women represent only one-fifth of all jobs in the oil and gas industry. In addition, they are far more likely to be funneled into office or business support positions (50 per cent) rather than technical or field positions (15 per cent). Yahya A. Abushal, then acting general manager at RTR, says: "Saudi Aramco has always demonstrated a leading role in creating career opportunities for both men and women. Throughout time, women have reached executive level positions, which is empowering to the generations ahead. Today we are reaping the benefits of the gender diversity decisions that were made in the past decade. "As a kingdom, the benefit we gain is that we are starting to tap into the talent of the other half of society, who are now able to participate in more parts of the economy," Abushal adds. "In RTR specifically, you will proudly witness the presence of female professionals’ leadership and contributions across all disciplines. The journey of their personal and career growth is unmatched through the wealth of learning and expertise within our operations. For the company, these women are becoming role models for those who will follow them. The future is absolutely bright and promising ahead for all." Saudi Aramco, much like the kingdom, is going through significant changes, especially when it comes to gender diversity, specifically in the core business area of the company, says Lamah F. Al Khayyal, acting administrator for Saudi Aramco’s Women in Development and Diversity. With the increasing number of female students graduating from science, technology, engineering, and math (STEM) disciplines and majoring in STEM fields, more opportunities are becoming available to young Saudi women, says Al Khayyal. "Organisations are becoming more aware of the diverse talent hiring pool, resulting in more female candidates being included. Saudi Aramco management is recognising the potential of such talented females and are further working on paving the road for their success in the core business area," she says. Currently, women still comprise a relatively small percentage of the workforce and even a smaller percentage in chief position holder positions, Al Khayyal says. But this is now growing, and with the new opportunities allowing females to gain hands-on experiences in some field positions, more leadership roles will open up in the near future for those who gain the needed experience and can rightfully compete for positions. There are unique initiatives that are being introduced by various organisations, such as Upstream, Downstream, and Technical Services, to support the development of females across the company. "Our goal is not to simply increase the number of women in the company," says Al Khayyal. "Our objective is to provide women the opportunity to venture into technical fields and build their skills and qualifications to create a more diverse workforce for Saudi Aramco." On any given day, you will find Maria G. Alfaraj – a secondee from the Inspection Department — inside RTR, checking on equipment and working with operations and maintenance engineers to find solutions that will keep the plant running safely and efficiently. Like her male colleagues in the RTR Engineering Support Division, she came to her job well prepared, with a degree in mechanical engineering and business administration. And like them, she has been entrusted with significant responsibilities. "My colleagues in the plants are welcoming and supportive," Alfaraj says. "They’re always willing to share ideas and challenge me and my ideas." Ultimately, she believes that participating in field work at the refinery is a way of contributing to the company’s success in one of its core businesses – refining. 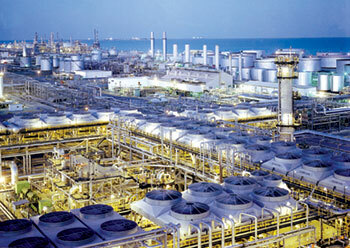 "The refining business remains one of Saudi Aramco’s core businesses. Wherever we work in the company, somehow we are all related to the refining business chain. It’s gratifying to contribute in the field and to create value for the company with solutions that help our business succeed," says Alfaraj. Her supervisor, Farooq Khan, calls Alfaraj one of his team’s top performers, and he says performance on the job has been the best way to overcome potential "gender-based" skepticism from other organisations within RTR. "Technically, we make no distinction in engineering between men and women. All we need are the skills and professionalism," says Khan. Alaa S. Alahmed, a mechanical engineer in RTR, says working inside the refinery every day is one of the greatest experiences to apply her knowledge and widen her skills working alongside colleagues on some of the company’s biggest projects, such as the Integrated Manufacturing Operations Management System. She adds that diversity is important in all life perspectives, culture, and thoughts – not just in engineering. "If you’re passionate about something, your fingerprint will be a definite difference," says Alahmed. "Theory and hands-on experience go hand in hand; they complement and complete each other." Feras A. Anazi, supervisor of Alahmed’s unit in Engineering Support, says he has been "very impressed with the quality of the female engineers we have had – Alaa and Maria, and Reema A. Aldhaneem before them. They add a lot of value to our workforce. Alaa was able to perform optimally in a male-dominated environment with confidence. She is passionate about engineering, and that has given her the courage to overcome a lot of her challenges working in the refinery. Also, Alaa is very excited to deliver presentations to a large group of people – and she does it very effectively." Sara F. Soleja says that when she joined RT Operations Engineering, she requested to be sent to the field because "refining is a core business for Saudi Aramco." In her field assignment with the refinery’s planning group, Soleja uses optimisation software to operate the refinery at the most economical and efficient level, responding to the constantly changing global demand for certain refined products. "The reality is that there are so many opportunities for young employees at Saudi Aramco," she says. "But you have to take the first step. If you don’t show interest, you’re not going to get it." Moothy A. Alelaiwy, a secondee from the Facilities Planning Department, says she had only one concern when she joined RT Operations Engineering – she wasn’t busy enough. Her supervisor, Rebal O. Ismail, told her, "OK, brace yourself," before he put her in charge of planning for the entire refinery, communicating on a daily basis with the company’s Oil Supply Planning and Scheduling Department in Dhahran to ensure the refinery meets customer demand. Ismail, who supervises both Soleja and Alelaiwy, says Saudi Vision 2030, with its support for female employment, is "helping a lot; it’s changing the culture. Once people get used to women working in the plants, it won’t be such a shock anymore." Supporting every organisation at the refinery complex are the RT labs, where lab scientists and chemists test samples all along the refining process to ensure safety and to assure the company’s customers that the finished products (diesel, kerosene, gasoline, etc.) measure up to Saudi Aramco’s strict standards. Deimah A. Esmail, a veteran lab scientist with seven years of experience, analyses water samples to ensure that any water that is discharged back to the sea is completely free of hydrocarbons. Her supervisor, Nasser M. Ahmary, says she was a critical contributor in updating systems and methods at the RT lab, and training her colleagues on lab equipment. "Our work is very critical for the refinery," Esmail says. "The results are urgently needed, and if there is any delay, it affects the process. But this is a great place to start out your career. It’s like college, and you learn a lot here." Asma Y. Alfahad, a chemist at RT labs, says attention to detail is a vital part of her work with gas chromatography equipment. Before she even turns on a single piece of equipment, she inspects each instrument and changes any part of the instrument to avoid failure. By doing so, she is not only protecting the company’s reputation for quality products, but she is also ensuring safety in the lab for herself and her colleagues.